Microsoft is planning to release more details about the upcoming Windows Store at an event in San Francisco tomorrow. The Windows Store will become the central hub for developers on the new platform to sell their software to desktop, tablet and notebook users. Distribution of Metro style apps will be treated similarly to Windows Phone 7 apps. Customers will be able to download free and paid apps in addition to trial versions and those featuring in-app payments. It is believed that businesses will be able to make apps available to their employees using the store mechanism. Enterprise customers and developers will be able to side-load Metro apps (i.e. download and install independently of the Windows Store) for testing purposes or deploying across many computers. Traditional Windows software will continue to be sold through brick and mortar stores and via online downloads rather than in the Windows Store. Developers will, however, have the option to create a landing page for their software in the Windows Store which will instruct customers on how to purchase their program through alternate outlets. All other apps and software can be found in the Windows Store. Fox News notes that details about the developer program are still scarce although some sort of revenue sharing program is expected based on references found in some documents. 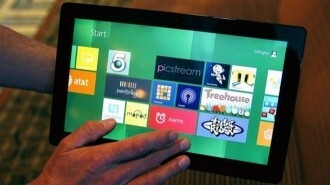 Earlier reports indicate Microsoft would get a 30 percent share of revenue from apps sold in their store. We should know more about Microsoft's plans tomorrow.